Prime Minister Narendra Modi on 26th of May inaugurated the country's longest river bridge-The Dhola-Sadiya bridge over the Brahmaputra river in Assam. Marking the third anniversary of the NDA government at the Centre, the prime minister dedicated the bridge to the nation. The over Rs 950 crore bridge which assumes strategic significance given its positions vis-a-vis the Indo-China border in Arunachal Pradesh, will give a major boost to tourism. 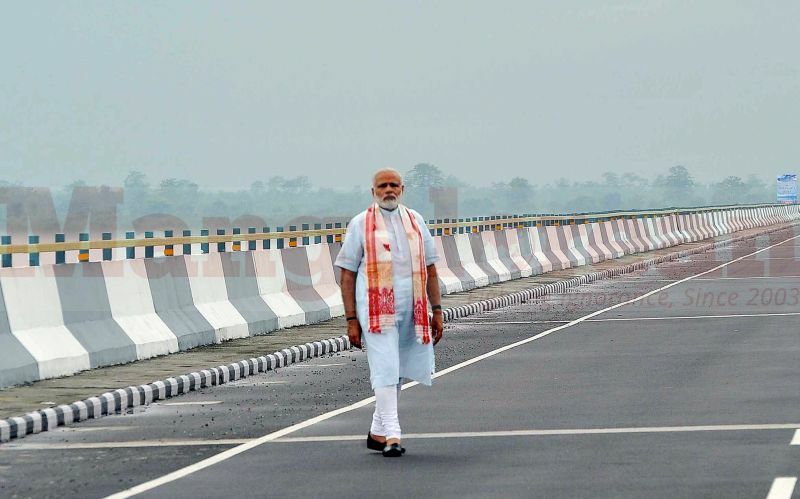 Modi also announced that the government has decided to name the bridge after singer Bhupen Hazarika, who hailed from Sadia. "The bridge will not only save money, reduce travel time but it comes as a foundation for the beginning of a new economic revolution. That's why the whole nation has its eyes on this bridge", Modi said here on the third anniversary of his government. He said, "The bridge will bring development to Assam and Arunachal Pradesh. For fulfilling India's dream of becoming a top economically developed nation, a superpower, then the North Eastern region is the place, to begin with", he said. The Prime Minister said the government has been striving for long lasting development by creating a permanent infrastructure for fulfilling the dreams of the nation. PM Modi said, "This bridge will also open a new road for the high-quality North East ginger grown by farmers of the region and improve their economic condition. If they take to organic ginger farming, a global market will open up to them".